Then input and arrange the text. If this text is pasted from the memory buffer from Microsoft Word, then we recommend clicking the "Cleanup messy code" button in the visual editor. You can paste the copied text from the memory buffer by pressing (at the same time) the CTRL+INSERT (keys on your keyboard). 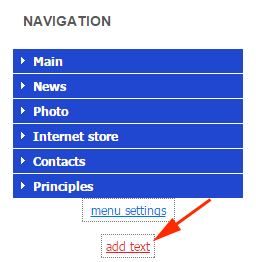 Save the text, and it will appear under the navigation menu.